Plan to root your Android device? If you use Sony Xperia E3 Dual with Android 4.4.4 Kitkat, stay here. This guide is specially written for you. 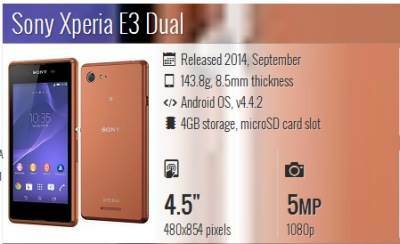 Check it carefully that it should be Sony Xperia E3 Android 4.4.4. Both of the device and Android OS should be matched. If not, you need to search another rooting guide. You’re sure that this guide is perfect for your phone? OK. Let’s read on to check the steps to root your Sony Xperia E3 Dual step by step. Rooting can void your warranty. You’re doing it at your own risk, and you’ve already know it. Get your data backed up to prevent data losing, and you’ve get it done. Download the app from this page, and install the tool on your Android device. Install the program like you would do for any other Android app. When done, run the tool on your device. If your Android smartphone or tablet is supported by this universal one click root program, you will be able to tap on the “Try to root” or “Start to Root” button which is located on the bottom of the display. Wait for a few minutes (Your device must connected to the internet). When done, the “success” message will be displayed. And you should be rooted now! The Sony Xperia E3 Dual is now rooted successfully on official Android 4.4.4 Kitkat. Navigate to the app list on the phone and open an app called Kinguser. Update the binary in case asked to. Download and install Root Checker app from Google Play Store to verify the root method is installed and working properly.